The EE310 with Multi-Functional Display. The EE310 transmitter is dedicated for demanding process control. The multi-functional display offers an optimum overview of the measuring task and enables intuitive operation. 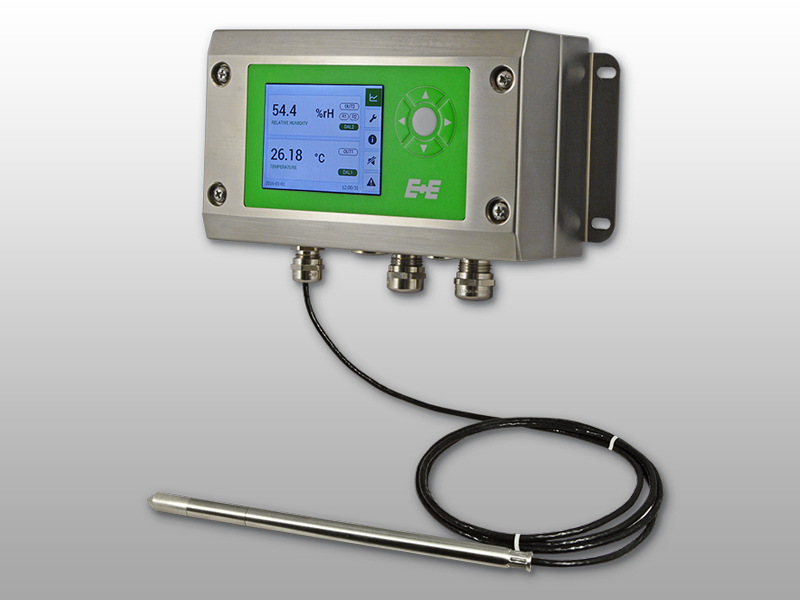 The built-in data logger facilitates continuous recording of the measured data. 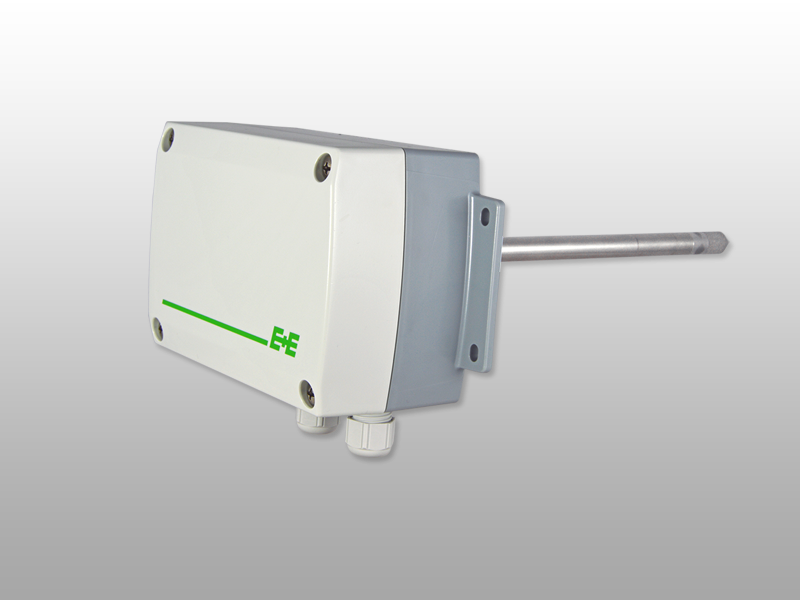 EE310 is available for wall or duct mount, as well as with various remote probes. 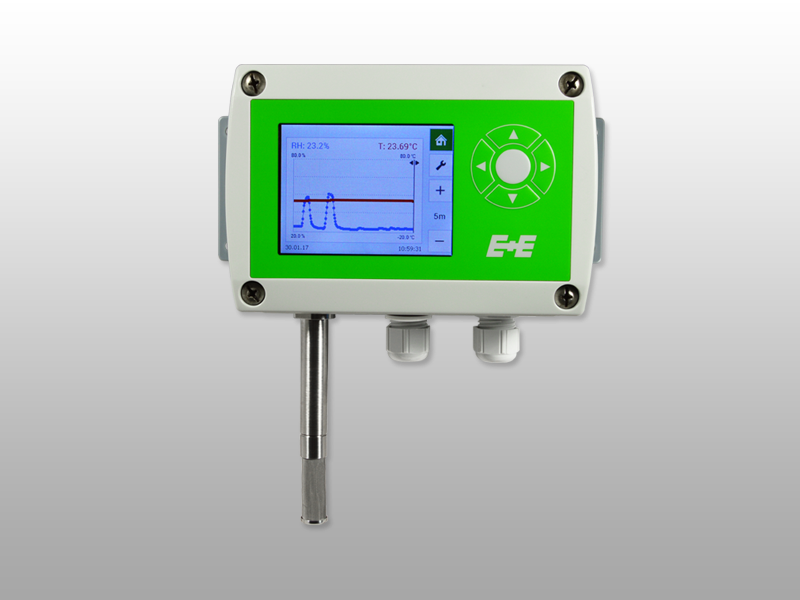 The EE310 measures humidity and temperature in the range from -40 °C to 180 °C (-40…356 °F) and up to 20 bar (300 psi). Furthermore the device calculates dew point temperature, frost point temperature, wet-bulb temperature, water vapour partial pressure, mixing ratio, absolute humidity and specific enthalpy. The highly accurate transmitter is ideal for industrial process monitoring and control, as well as for use in climate and test chambers, dryers, humidifiers or clean rooms. 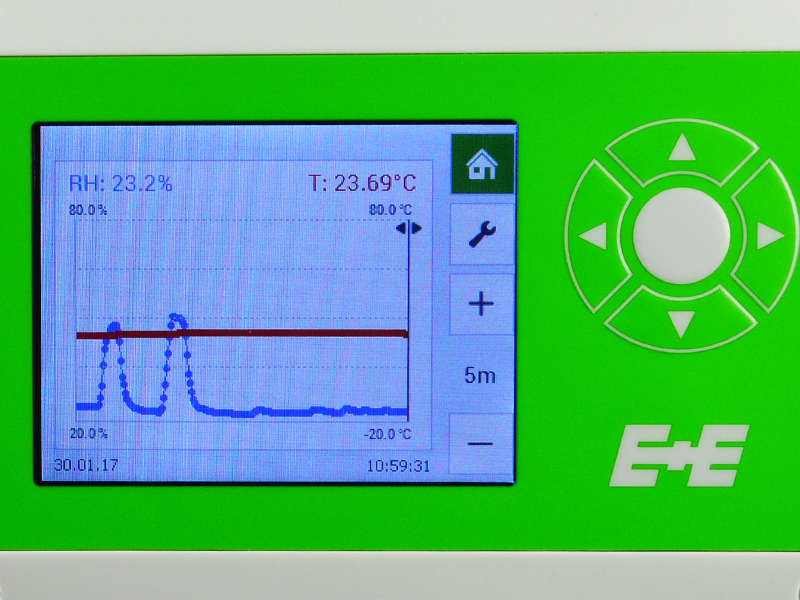 The large TFT display of the EE310 provides an optimal overview of the measurement task. The stored values can be displayed as graphs on the display. The 3.5“ TFT colour display offers an optimum overview of the measuring task. The data logger allows continuous recording of 20,000 values per measurand. The intuitive menu navigation facilitates operation and configuration of the transmitter. Extensive error diagnostics and alarm settings can be also performed directly on the device. 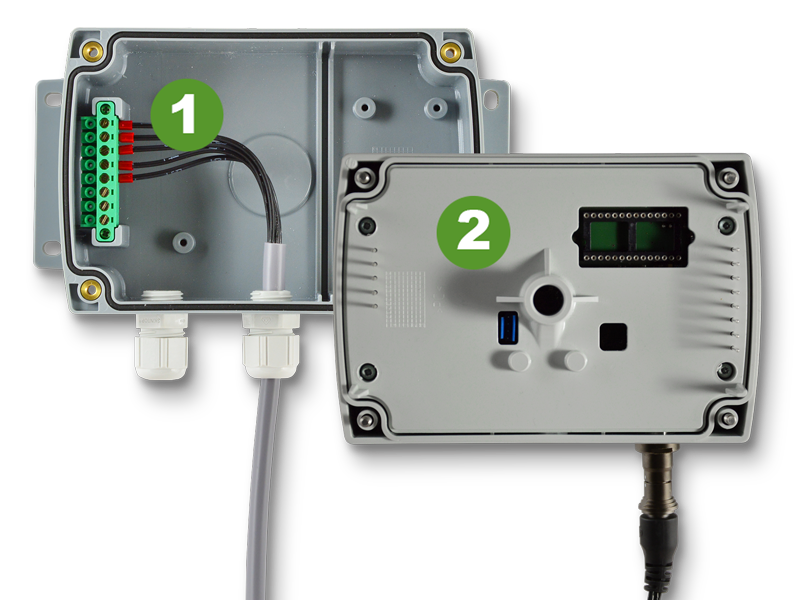 The modular enclosure of the EE310 consists of the mounting unit (1) with integrated screw terminals for wiring and the evaluation unit (2), which accommodates the measuring electronics and the sensing probe. For maintenance purposes, the evaluation unit can be plugged off and replaced within seconds, while the wiring remains untouched. The two-part enclosure facilitates installation and maintenance of the EE310. For particularly high requirements, the EE310 is available with a high-quality stainless steel enclosure. EE310 is available for wall or duct mount, as well as with various remote probes. The remote probes can be employed up to 180 °C (356 °F) and 20 bar (290 psi). The E+E proprietary sensor coating protects the sensing elements from corrosive and electrically conductive contamination. This leads to long-term stable and reliable measurements and increases the service life of the sensor even in harsh environment. 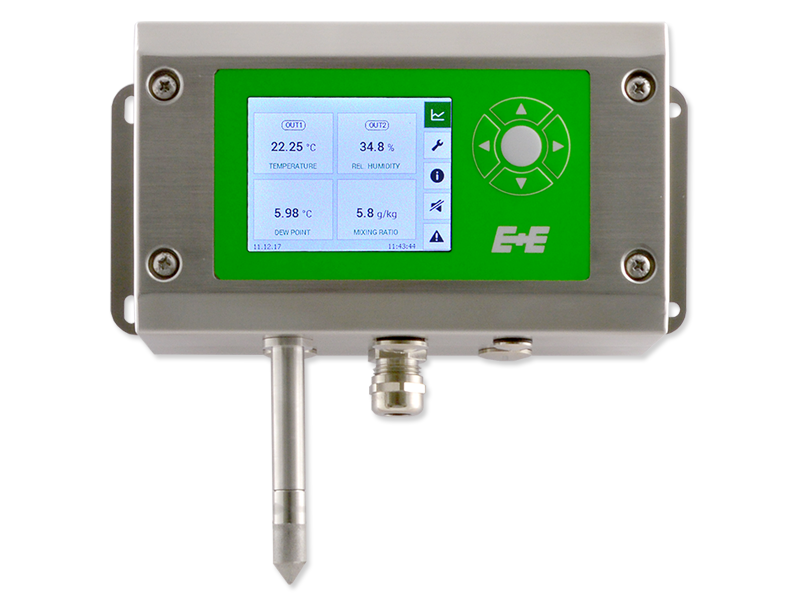 The EE310 offers two analogue outputs (current / voltage) and an optional Modbus RTU or Ethernet interface. Two freely configurable relay outputs can be used for control or alarm purposes. 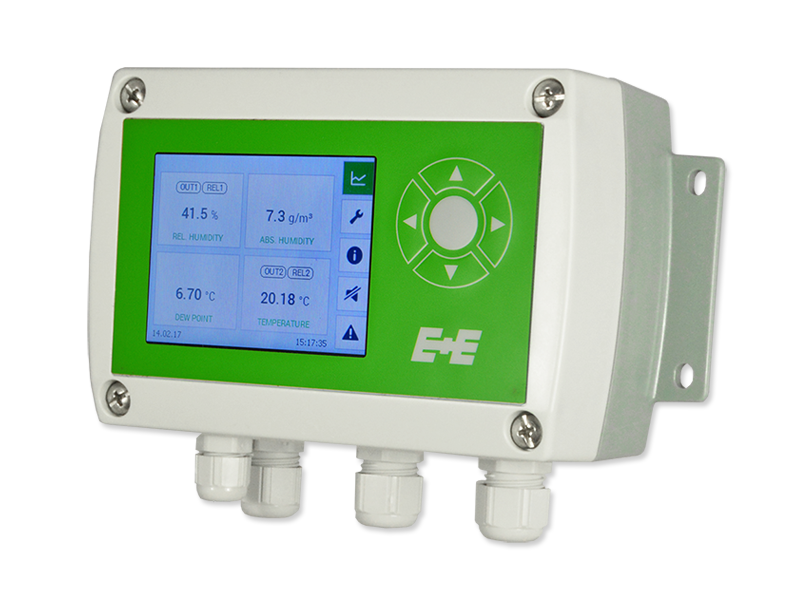 Configuration and adjustment of the EE310 can be easily performed also with the free product configuration software EE-PCS using the USB interface. Download of the logged data and firmware updates are possible as well. E+E Elektronik Headquarters, Engerwitzdorf/ Austria. Since more than 20 years, E+E Elektronik develops and manufactures sensors and transmitters for humidity, temperature, dew point, moisture in oil, air velocity, mass flow, CO2 and pressure. The main applications for E+E products lie in HVAC, building automation, industrial process control and the automotive industry. A certified quality management system according to ISO 9001 and IATF 16949 ensures the highest quality standards. E+E Elektronik has a worldwide dealership network and representative offices in Germany, France, Italy, Korea, China and the United States. 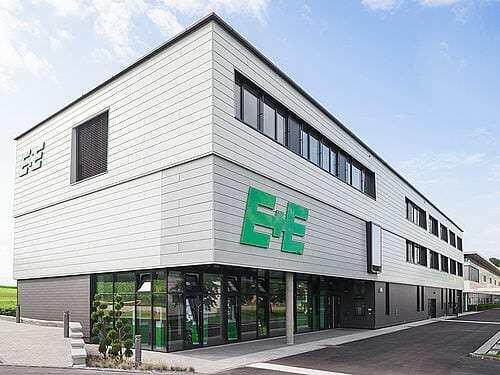 The accredited E+E calibration laboratory has been commissioned by the Austrian Federal Office for Metrology (BEV) to provide the national standards for humidity and air velocity.